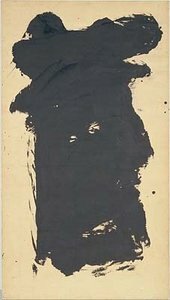 Franz Kline’s relationship with East Asian calligraphy is one of the most contested aspects of the interpretation of his oeuvre, with critics making comparisons between his work and Chinese or Japanese calligraphy throughout his career.1 However, although pointing out the visual similarity between Kline’s black and white abstract paintings and East Asian calligraphy became an established mode for addressing his art, the later reassessment of this relationship by Kline and the calligraphers turned out to be a highly politicised venture. Kline’s Meryon 1960–1 (Tate T00926), a large painting consisting of dynamic black and white strokes, presented Kline’s return to an earlier stage in his career, when his connection to East Asian calligraphy had been most evident. As this essay will demonstrate, Meryon, created late in Kline’s life and some ten years after he made his first large black and white abstractions, encompassed a decade of negotiations, rivalry, hidden aspirations and mutual denials between Kline and Japanese calligraphers. It will be argued here that the visual simplicity of this dynamic and monumental work is outbalanced by the multitude of meanings and interpretations it offers. The intense brushstrokes contain traces of Kline’s personal development as an artist and the entangled histories of post-war artistic exchange between Japan, the United States and Europe, and this is reflected in the responses of several art critics who shaped the cultural agenda at the time. By dissecting these interpretative layers of Meryon, this essay will demonstrate the possible discrepancy between the actual visual qualities of the artwork and the perception and interpretation of it by others, including its creator. When critics mentioned Kline’s possible inspirations from East Asian calligraphy, they regarded this either as a sign of Kline’s international prominence or as a curious coincidence, which added an exotic flavour to American abstract expressionism.2 Until recently, however, it was left unmentioned that Japanese calligraphers – most prominently the Kyoto-based avant-garde calligraphy group Bokujinkai – actively reached out to Kline and other abstract painters, contributing calligraphic theories and visual modes to abstract painting in the United States and Europe.3 Considering black and white linear abstraction their natural domain, Japanese calligraphers keenly interacted with international artists, including Kline, in order to find common ground and understanding between artists from different parts of the globe, and to situate calligraphy within the progressive modern arts. Thank you for your letter and the [issue of] Bokubi. I am very grateful. I deliver each issue to [art book dealer George] Wittenborn’s friend, [Charles] Egan. Egan is exhibiting them in his gallery, and then hand-distributing them, as Noguchi suggested. I am also keeping two issues at hand. Studying them is a great joy for me, which also my friends who are artists and musicians share with me. Besides, I sent the Bokubi journal with the illustrations of Mr. Hasegawa’s screens to Ms. Rockefeller. She answered that it would be wonderful to exhibit them at Hasegawa’s solo exhibition, and the gallery people were also excited about it. I think it would be good to consult the gallery concerning the catalog, layout, work arrangement etc. Same as you, I have the feeling of working very close to you. Thank you for that once more. Here we can see that Kline was not only looking at modern Japanese calligraphy, but was also involved in its promotion abroad, contributing to calligraphy’s international breakthrough in the mid-1950s by introducing it to his network of American abstract artists and their benefactors. The letter to Morita shows that not long after his turn to abstraction in the late 1940s, Kline enthusiastically cherished his relationship with the Bokujinkai. Like Morita, who saw in Kline’s works the ‘same beauty as in calligraphy’, Kline’s letter spiritedly confirmed that he felt as if he was ‘working very close[ly]’ with Japanese calligraphers. For Kline, contact with the Bokujinkai artists was a first-hand source of information about this East Asian art form, which captivated him visually, and Bokujinkai’s interest in Kline’s art served as proof of Kline’s recognition in as remote a location as Japan. Kline continued to exchange letters with the Bokujinkai, receive their journal and promote it among his fellow artists. His personal archive contains many photographs of works by post-war calligraphers sent to him by Morita and his mentor Ueda Sōkyū, as well as numerous issues of the calligraphic journals Bokubi and Bokujin, along with other Japanese art journals, such as Sansai and Geijutsu Shinchō, spanning the years 1950 to 1957.7 While it is not possible or perhaps even necessary to know who saw whose works first – Japanese calligraphers Kline’s abstractions, or vice versa – in the early 1950s it became obvious to both the Bokujinkai and Kline that they had passed into common visual ground, albeit from different entry points. Upon seeing new avant-garde calligraphy by Morita or Inoue Yūichi, Kline must have realised that his large-scale works with dramatic black strokes on a white background inevitably invited associations and comparisons with modern calligraphy, such as Morita’s 蒼 (Sō; Deep Blue) from 1954 (fig.2). This similarity had different implications for Kline and the Bokujinkai. For calligraphers, contact with young American artists in the atmosphere of Japan’s post-war liberalisation and the active re-establishment of the artistic exchange between Japan and the US was a hopeful sign that calligraphy would receive more international attention and be recognised on a par with abstract painting. In order to stress their global orientation, calligraphers occasionally included English-language articles in their journals, and Bokubi provided short English summaries and tables of contents in each of its issues. The argument for Kline’s dissimilarity with calligraphy can also be regarded critically from an aesthetic point of view. Kline’s claim that ‘calligraphy is writing and I am not writing’ is only true for traditional calligraphy. 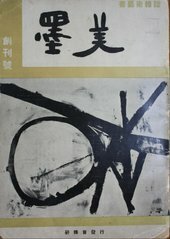 From the late 1940s onwards Japanese avant-garde calligraphers, whose works Kline saw, experimented with abstraction and created fully abstract works unrelated to Chinese characters or the Japanese alphabet (both of which are used in calligraphy), as can be seen in Inoue Yūichi’s Work A 1955 (fig.3). These experiments rendered the calligraphers’ reference to writing purely visual, much like in Kline’s painting. Kline’s next claim about his and his contemporaries’ use of ‘painted’ space is also questionable. Post-war avant-garde calligraphers experimented with various backgrounds and often included painted ones, sometimes colourful, in their works, as well as incorporating the concept of negative space into their thinking about calligraphy. 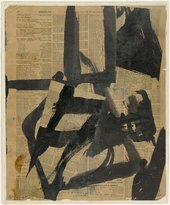 Inoue, for instance, occasionally used newspaper pages as backgrounds for his calligraphies such as花 (Hana; Flower) 1957 (fig.4), which is very far from the plain white background that Kline is talking about and very close to Kline’s own experiments with painting on phonebooks (see, for instance, Untitled II c.1952; fig.5). This comparison by Washburn implied the inability of Japanese calligraphers to break with their traditional roots and divorce their art from convention, meanwhile praising Kline’s work for its dynamism and unrestrained creative energy. By the end of the 1950s Kline had irrevocably secured his place in the constellation of celebrated American abstract expressionists, his art rhetorically well defended from allegations of foreign influence. His secure position in the American art community granted him many more artistic freedoms. Firmly anchored in the narratives of American art, Kline could finally return to the images that absorbed him earlier and attracted the attention of Japanese calligraphers – his large black and white paintings. Whether calligraphic or not in its intention, Meryon, with its strong contrasts between black and white, straight lines with dynamic, visible brushstrokes and symbol-like brevity, represents Kline’s visual emancipation from the restraints imposed on him by critics. Meryon returns to the type of abstract painting that captivates with its ambiguity and simplicity, inviting viewers to read it while escaping these attempts at interpretation. Meryon references the earlier calligraphic mode of abstract expressionism, yet relabels its features from what was perceived as East Asian to what was agreed upon among critics as American. Ironically, the visual qualities of Kline’s black and white imagery hardly changed in this renegotiation process of the early 1960s. Over the long decade of their negotiations, both Kline and the Japanese calligraphers, perhaps paradoxically, managed to achieve their goals. While Kline entered the canon of American abstract expressionism, the Bokujinkai triggered an international breakthrough for calligraphy and reached global audiences at the Museum of Modern Art in New York in 1954, Documenta in Kassel in 1959 and the São Paulo Biennial in 1956, 1959 and 1961. Through similar, visually stunning artworks, Kline earned recognition from critics such as Greenberg for finding an American mode of abstraction while calligraphers were praised for presenting a modern take on Japanese tradition and spirituality. Furthermore, through Kline, the Bokujinkai inserted Japanese calligraphy into the body of modern abstract painting around the time that Kline’s calligraphic images became emblematic of post-war American art. The degree to which Kline did so in a way that was informed by calligraphic references, or unconsciously reflected their visual appeal, remains debatable. Yet both Kline and the Bokujinkai achieved their aims at the cost of their relationship with each other. After feeling neglected by Kline and the American critics, Japanese calligraphers reoriented themselves towards European art informel as an alternative mode of calligraphic abstraction and its contextualisation. As with Kline, calligraphers learned about European abstract artists from reproductions of their works, and attentively studied their visual approaches to painting and calligraphic features. 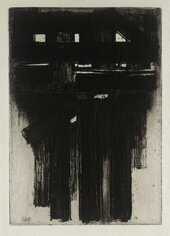 For instance, the extensive 1953 roundtable discussion of modern art and calligraphy among the central players of avant-garde calligraphy opened with an analysis of informel artist Pierre Soulages’s works, which were praised as ‘extremely poignant’ (see, for instance, Soulages’s untitled intaglio print on paper from 1956; fig.6).18 The Bokujinkai’s later relationship with Soulages and other European painters developed quite differently than with Kline. Unlike Kline, who never went to Japan, many prominent European abstract artists, including Soulages, Pierre Alechinsky and Georges Mathieu, travelled to Tokyo, Osaka and Kyoto from the mid-1950s onwards. There they willingly participated in calligraphers’ exhibitions and theoretical discussions, openly talking about their works and views on Japanese art. A 1958 roundtable discussion in Kyoto dedicated to calligraphy and Parisian painting brought together Soulages, Zao Wou-Ki, Japanese calligraphers and Zen philosophers.19 Encouraged by such attention from their European peers, calligraphers demonstrated the shift in their international orientation by changing the second language of their Bokubi journal from English to French as early as 1953. In doing so they, too, became involved in the rivalry between the European and American schools of abstraction, changing sides between the artistic opponents on the different sides of the Atlantic, and reinforcing the divide between them. Kline’s Meryon comprises an unresolved tension between politically motivated art historical interpretations, which ascribe it to American abstract expressionism, and visually evident aesthetic qualities, which suggest its connection to Japanese calligraphy. In Meryon, new American art grounded in American experience clashes with the artistically inspirational East Asian script. This tension forms the cognitive appeal of Kline’s large black and white works, infusing Meryon’s bold brushwork with the reverberations of a transatlantic and transpacific artistic rivalry. 1. For instance, Stuart Preston described Kline’s paintings as ‘calligraphic patterns’ (Stuart Preston, ‘Current Diversity’, New York Times, 22 October 1950, p.X9); Gretchen T. Munson claimed that ‘Franz Kline’s huge black symbols, surrounded by their white background, at first appear like inflated characters lifted from Chinese calligraphy’ (Gretchen T. Munson, ‘Franz Kline’, Art News, vol.49, November 1950, p.48); and Paul Brach stated that ‘The impact of stark unrelieved black and white gives a looming imminence to this artist’s huge calligraphic canvases’ (Paul Brach, ‘Franz Kline’, Art Digest, vol.26, no.5, 1 December 1951, p.19). 2. See, for example, Constance Perkins, ‘In the Galleries: Kline’s Originality Apparent in Show’, Los Angeles Times, 11 March 1963, p.C7. 3. Pioneering studies that investigate the role that Japanese calligraphy played in post-war art include Alexandra Munroe (ed. ), The Third Mind: American Artists Contemplate Asia, 1860–1989, exhibition catalogue, Solomon R. Guggenheim Museum, New York 2009; Ming Tiampo and Alexandra Munroe, Gutai – Splendid Playground, exhibition catalogue, Solomon R. Guggenheim Museum, New York 2013; Bert Winther-Tamaki, Art in the Encounter of Nations, Honolulu 2001; and Rolf Wedewer, Die Malerei des Informel: Weltverlust und Ich-Behauptung, Munich and Berlin 2007. 4. As calligrapher Higuchi Gazanbō recalled: ‘All calligraphy books open from right to left, but the Bokujinkai’s published works opened from the left, which was very surprising to me. Even the books had an artistic element to them. Though it was a calligraphy publication, they used an action painter’s painting on the cover, shocking both the world of calligraphy and art.’ Higuchi Gazanbō, ‘Special Spring Interview with Calligrapher Higuchi Gazanbō’, Intercross Creative Center, Sapporo, 23 January 2009, https://www.icc-jp.com/archive/feature/special/000194.html, accessed 1 August 2017. 5. Morita Shiryū (森田子龍), ‘クラインの近作を観て一書家の感想 [Kurain no kinsaku wo mite – shoka no kansō; Looking at the Latest Works by Kline – Calligrapher’s Thoughts]’, Bokubi, no.12, May 1952, p.6. Translation by the journal. 6. Franz Kline, ‘フランツ・クライン氏の手紙 [Furantsu Kurain shi no tegami; Letter from Franz Kline]’, Bokujin, no.2, May 1952, p.2. This is a retranslation into English of the translated letter published in Bokujin. The English-language original is unavailable. 7. For more, see the Elisabeth Zogbaum papers regarding Franz Kline, 1928–1965, Archives of American Art, Smithsonian Institution, Washington, D.C.
9. John Canaday, ‘A Critic’s Valedictory: The Americanization of Modern Art and Other Upheavals’, New York Times, 8 August 1976, p.71. 10. Hisamatsu Shin’ichi (久松真一), ‘書と東洋精神 [Sho to Tōyō seishin; Calligraphy and Oriental Spirit]’, Bokubi, no.48, October 1955, p.7, trans. by the author. 11. Katherine Kuh, The Artist’s Voice: Talks with Seventeen Artists, New York and Evanston 1962, p.144; also discussed and quoted in Winther-Tamaki 2001, p.60. 13. Gordon Washburn, ‘Japanese Influence on Contemporary Art: A Dissenting View’, in Dialogue in Art: Japan and the West, Tokyo 1976, p.207. The Rosati mentioned here is the American abstract sculptor James Rosati. Washburn does not give the date of this episode in his account. 14. Paul Richard, ‘Fierce and Unfamiliar: The Jarring Colors of Franz Kline’, Washington Post, 17 February 1979, pp.C1, C11. For more on Kline’s colour abstractions see Franz Kline: The Color Abstractions, exhibition catalogue, Phillips Collection, Washington, D.C. 1979. 15. Leslie Judd Portner, ‘The Big City Never Rests’, Washington Post and Times Herald, 25 July 1954, p.TS11. 18. Suda Kokuta (須田剋太), Nakamura Makoto (中村真), Yoshihara Jirō (吉原治良), Ōsawa Gakyū (大沢雅休), Morita Shiryū (森田子龍) and Arita Kōhō (有田光浦), ‘書と抽象絵画・座談会 [Sho to chūshō kaiga zadankai; Calligraphy and Abstract Painting: A Roundtable Discussion]’, Bokubi, no.26, August 1953, p.6. 19. Pierre Soulages, Zao Wou-Ki, Ijima Tsutomu (井島勉), Yoshikawa Itsuji (吉川逸冶) and Morita Shiryū (森田子龍), ‘書とパリ画壇ーひとつの出会いー [Sho to Pari gadan – hitotsu no deai; Calligraphy and Parisian Art Circles – An Encounter]’, trans. by Ōhashi Yasuo (大橋保夫), Bokubi, no.76, May 1958, p.6. Eugenia Bogdanova-Kummer, ‘Contested Comparisons: Franz Kline and Japanese Calligraphy’, in AnnMarie Perl (ed. ), In Focus: Meryon 1960–1 by Franz Kline, Tate Research Publication, 2017, https://www.tate.org.uk/research/publications/in-focus/meryon/japanese-calligraphy, accessed 26 April 2019.